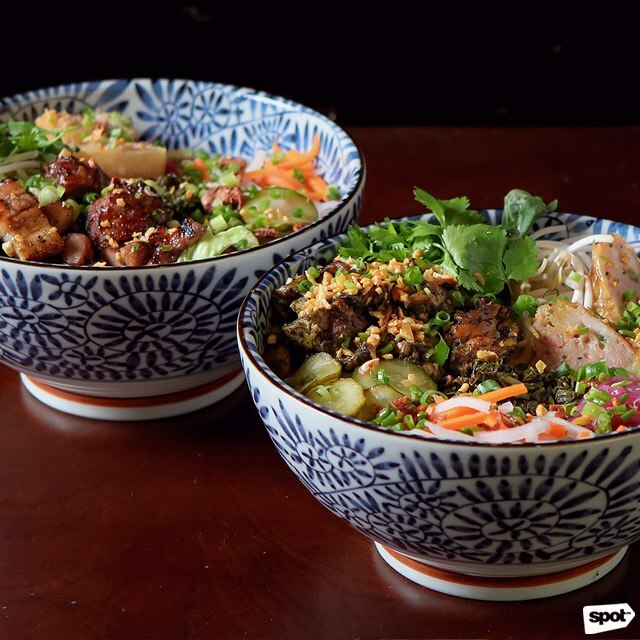 Juanh Mi whips up unique Vietnamese-Filipino dishes you won't find anywhere else. 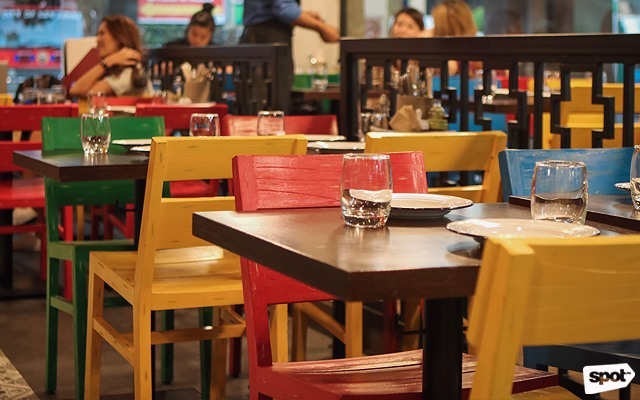 (SPOT.ph) Though part of the same region, Filipino and Vietnamese cuisine seem like worlds apart. While the Vietnamese favor light and fresh flavors, Filipinos love anything rich, saucy, and goes well with lots of rice. 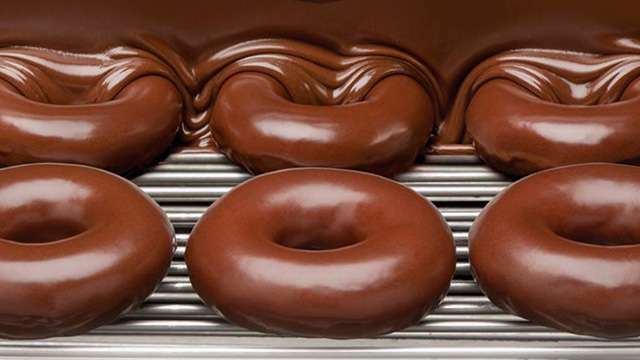 Can two opposite ends of the flavor spectrum meld together into something coherent, and even tasty? Chef Robby Goco thinks so. 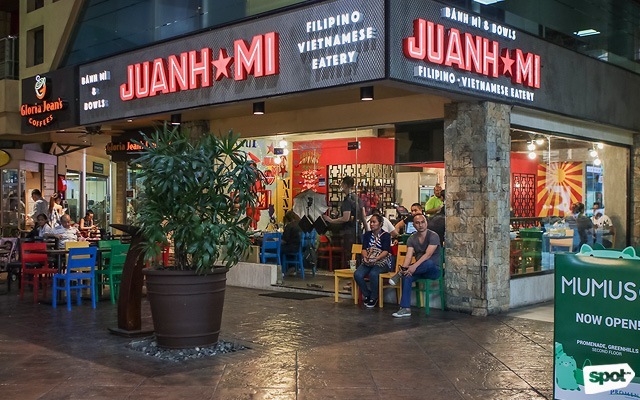 Together with Chef Tatung Sarthou, Francis Zamora and a few other partners, he’s shaking things up in Greenhills with his latest concept: The Filipino-Vietnamese Juanh Mi. 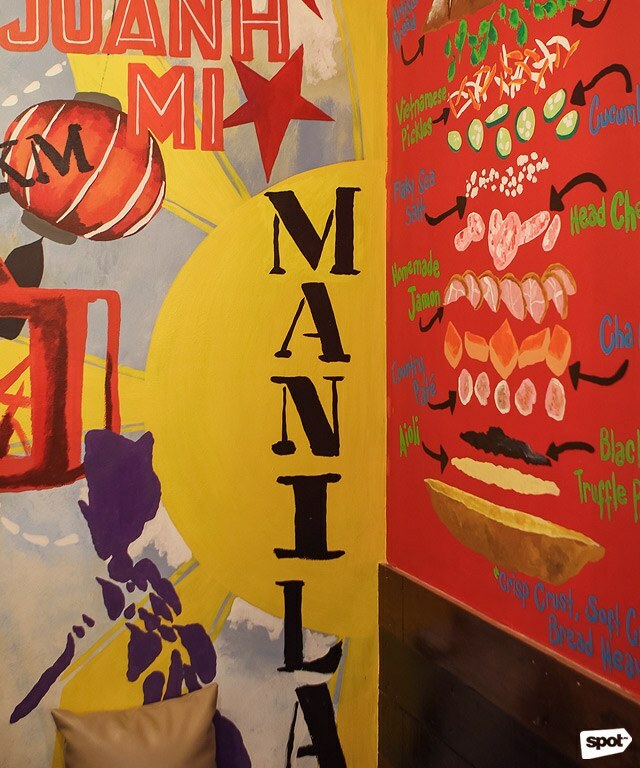 In their vibrant space at Promenade—with colorful chairs and cheeky murals that combine Vietnamese icons with Filipino puns on gritty concrete walls—chefs Robby and Tatung whip up food you’re unlikely to find anywhere else, like a Kare Kare Banh Mi (P400), a heaping serving of ox tripe kare-kare and crispy kalkag (Ilonggo dried shrimp to replace bagoong) plus the usual banh-mi fixings of liver paté, cilantro, cucumber, pickled vegetables, and homemade mayonnaise on a toasted baguette. 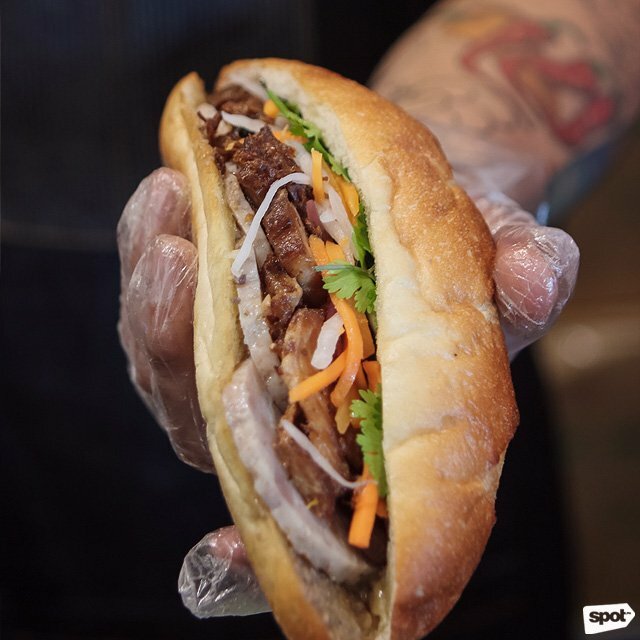 It looks unlike any banh mi you’ve tried before, but the flavors fit. The kare-kare is saucy and nutty, and the baguette is sturdy enough to soak up all the delicious sauce while still retaining its crisp-on-the-outside, chewy-on-the-inside texture. The pickled vegetables add crunch, while also balancing out the richness of the rest of the sandwich filling. Switching bagoong with kalkag is also a stroke of genius, as the dried shrimp adds a touch of brininess to complement the peanut sauce of the kare-kare, and crunch, too. Nutty, briny, tangy—these are flavors that are familiar to anyone who’s had banh mi, just in a different form. The chefs make it sound easy, but it takes a lot of creativity and daring to just throw all rules out the window. For example, not everyone thinks to stuff adobo in banh mi—which is precisely what the Adobo 2-Ways Banh Mi (P400) is. And they make it work. You get an almost indulgent savory flavor that’s distinctly Filipino from the succulent pork belly, but pickled vegetables keeps this sandwich fresh and light on the palate. And even when covered with all these tasty fixings, the bread still manages to stand out with its satisfying crunch and chewiness. 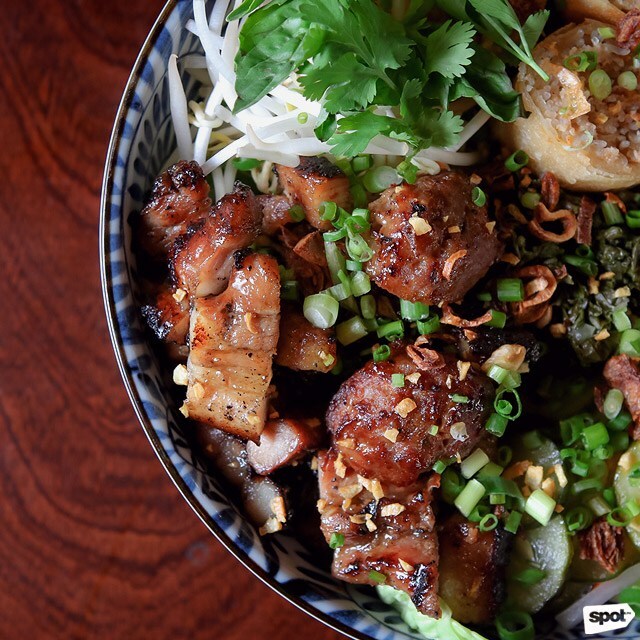 You can also opt to have your main as a bun salad instead of a banh mi, which will get you a picture-perfect bowl loaded with rice noodles (or shirataki noodles for an additional P150 if you’re avoiding carbs), fried spring rolls, pickled vegetables, fried shallots, and a nuoc cham dressing. A pretty safe though still tasty choice is the Pork Belly & Meatball Bun Salad (P350), with sweet-smoky barbecued pork and meatballs full of beefy goodness. But if you’re up for a culinary adventure—and you should be!—have the Pianggang-Tausug Chicken Inasal Bun Salad (P350), which is one of Chef Tatung’s signature dishes. Grilled and cooked in burnt coconut milk, the juicy chicken immediately takes center stage with distinctive smokiness and nuttiness. Add peppery mustard leaves and the zest and crunch of pickled vegetables, and you have a bowl that never lets up on flavor. 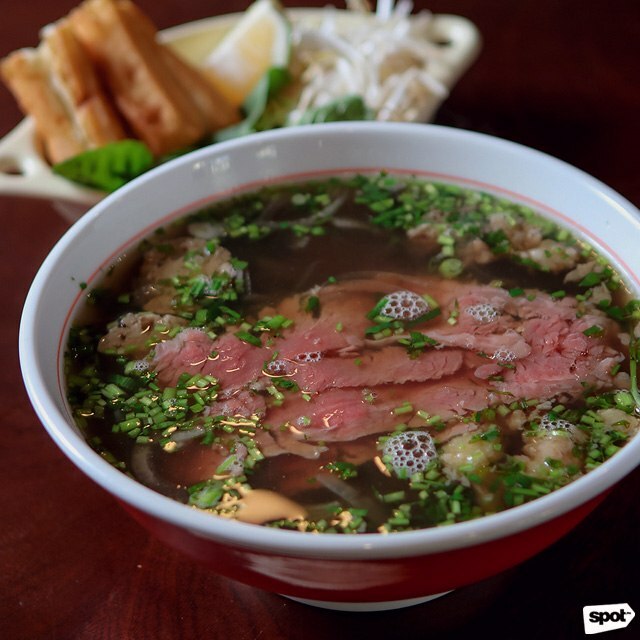 For those in the mood for something that leans more towards classic Vietnamese, there’s the traditional Pho Bo (P430), though it wouldn’t be Juanh Mi without a few Filipino touches. Here, it’s more subtle, with a broth that’s seasoned with pink salt and patis from Pangasinan. 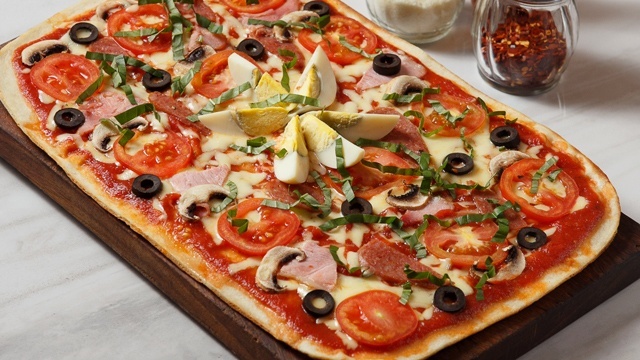 “I’m from Lingayen, Pangasinan,” says Chef Robby. “I come from the land of the best patis in the universe! Of course I’m going to use the best of the best from my province.” The change may seem minute but it’s there in the broth, fresh and hearty, but also a little bolder. 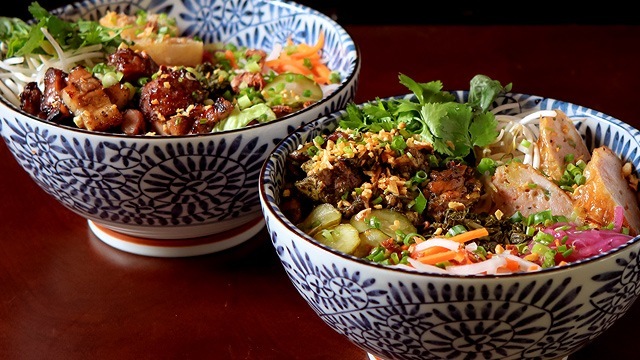 It’s easy to look at Juanh Mi’s menu and quickly latch on to the more traditional renditions of Vietnamese fare. But the fun vibe of their in-your-face colorful space encourages you to take a leap of faith into something a little more adventurous. 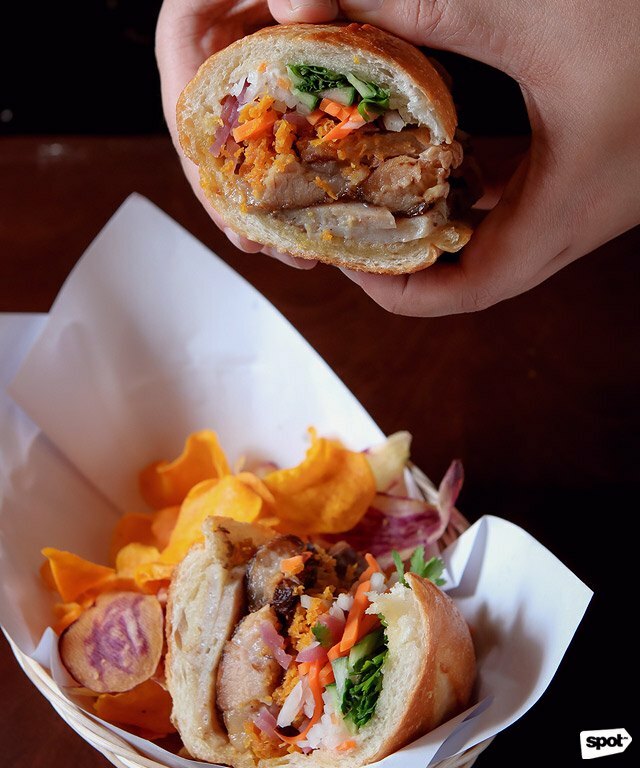 So go on, have that kare-kare banh mi, and discover the possibilities that can come from daring to bend the rules.